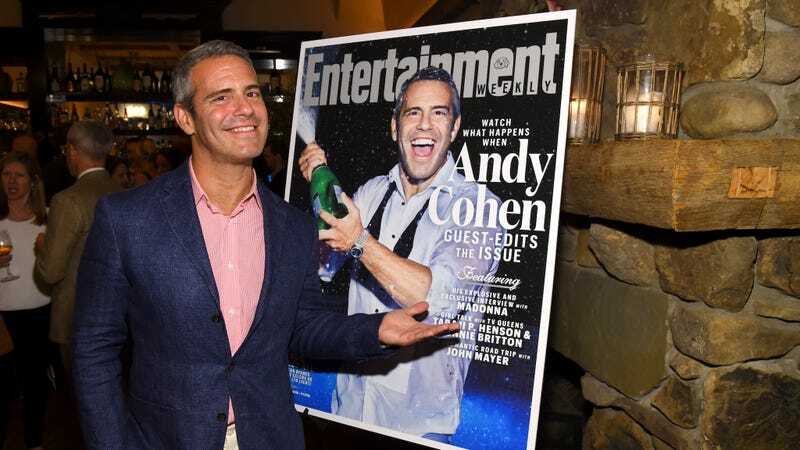 Andy Cohen will not be denied the opportunity to entertain us on the final day of the year by hosting a sure-to-be-fun New Year’s Eve edition of Hollywood Game Night. At 10 p.m. on NYE—if you’re not already out toasting away what a lame and disappointing year this was (not for me, it was great)—tune into NBC’s New Year’s Eve Game Night With Andy Cohen. This is the first time NBC will break from the celebratory New Year’s tradition so we can instead watch eight celebrities play party games like Charades against each other. Consider it yet another one of television’s attempts to prove these famous people are like normal people. Insiders indicate NBC was looking to shake things up by offering an alternative to the traditional New Year’s Eve coverage where ABC has been the longtime established player. Hollywood Game Night host Jane Lynch reportedly had other commitments but continues as host of the regular series, which returns for Season 4 on January 5. This is obviously Cohen’s dream come true. “I love three things—a party, live TV and celebrities playing games—so combining all three on New Year’s Eve is my idea of a perfect night,” he says. Mine, as well. After the special, Cohen will pair up with your other best friend Carson Daly, at 11:30 pm to start the countdown to 2016 in Times Square, where Gwen Stefani will perform. But again, the games will definitely be the best part of the night.